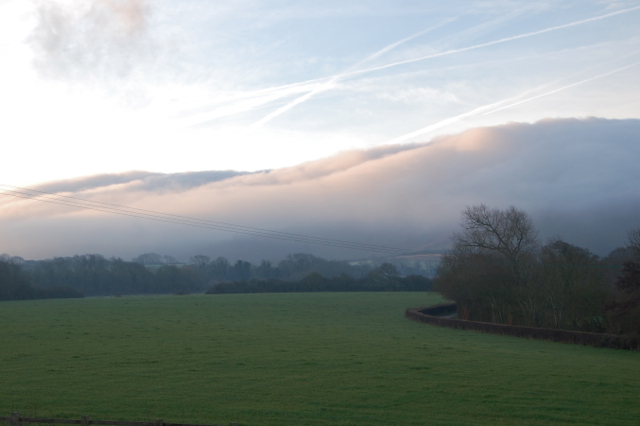 After a very wet summer and autumn and a similar start to this year, everything is feeling decidedly damp. Our snow melted after a couple of days and it seemed that was the only taste of real winter we have had. 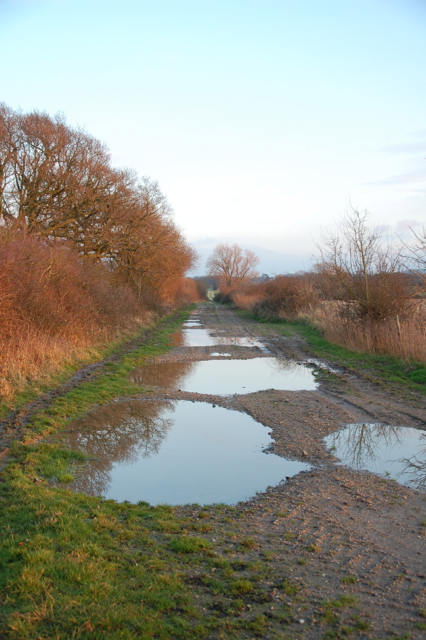 Now everything has returned to the general dampness that has characterised most of the last year, a perpetual grey autumn leading on to a somewhat murky spring. The path from our house hasn’t dried out in months, the few bright days we have had not being enough to combat the effect of months of wet! Whilst it may sound like an obvious point to make, the environment and weather patterns outside our door play a vital role in the patterns of health and disharmony that we experience at any given time. So it’s little wonder than this year has been especially prolific in damp, phlegmy colds, chesty coughs and stuffy noses. The milder temperatures also allow bacteria to thrive and the general feeling of stagnation that comes from a water logged environment contributes to stagnation in our own bodies. So many people I have spoken to this winter have had colds and coughs that have hung on stubbornly for longer than usual and, even after they are feeling much better, there has still been some lingering phlegmy-ness! While mucus is a natural and important part of our bodies, lining and protecting delicate membranes, phlegm is essentially the mucus of the respiratory passages gone bad! Whilst a balanced amount of mucus is essential to health, phlegm is often thicker, stickier and more related to states of disease or disharmony. Often when there is infection, the body will produce more mucus to help cleanse out the membranes but this can become congested or stuck leaving us with blocked passages along with a general sense of tiredness and malaise. In TCM (Traditional Chinese Medicine) conditions of ‘phlegm’ often arise from excess ‘damp’, but whereas damp is thin and watery, phlegm will be thick, sticky and cause obstructions. There will usually be a more obvious thick coating on the tongue along with other signs of congestion. Phlegm can also cause a whole host of other symptoms from dizziness and swellings to palpitations and a feeling of detachment. Dietary measures are often recommended to combat excess damp or phlegm including reducing or eliminating damp causing foods like dairy, bananas, pork, wheat products, beer and sugary foods. Foods to add in often involve root vegetables, garlic and onion, warming spices and teas of orange or lemon peel. In Ayurvedic medicine phlegm would be seen as a disorder of kapha and treated with warming, drying herbs and lifestyle advice, as it would in Western energetics where the appropriate term, ‘phlegmatic’ sums up the constitution that is prone to an excess of the humour ‘phlegm’. Depending on the nature of the client and their disharmony, there would be a few herbal categories that we would want to consider when treating people with excessive phlegm including mucus membrane tonics, immune tonics, expectorants, anti-catarrhals and possibly diaphoretics. Firstly, if possible we would want to think about eliminating causes. This is relatively easy if they are dietary but much harder if they are environmental (a nice long holiday perhaps?). Then we would generally think about treating symptoms with a mix of herbs. Bearing in mind that everyone is different and each person’s unique symptoms and constitution must be considered, here is a list of a few herbal helpers that you may find useful when phlegmy-ness strikes. Warming spices and aromatics: For many problems involving phlegm, these will be our first herbs of choice. Most warming spices will also have a slightly drying quality and many of the best ones can already be found in your kitchen cupboard such as ginger, cayenne, cinnamon and cardamom. Regular doses of these as tea or tincture will help to warm your whole body which will thin mucus and enable it to be expelled more easily. You can also add them to foods- think of how your nose runs after a spicy curry! Aromatics will open up the channels and move stagnation and some are still harvestable over the winter months, even though they may not be at their peak in terms of taste or constituents. In particular I have been using rosemary and thyme from the garden this winter to add to foods or to make simple teas that warm body and mind and disperse congestion. Among the most useful of the aromatic herbs for phlegmy coughs is elecampane, Inula helenium, which has a wonderful combination of warming stimulating essential oils and soothing relaxing mucilage. Mucus membrane tonics: In this category, goldenseal reigns supreme for treating the sinuses, however it is not a native herb and is highly endangered in the wild. Luckily there are some who are trying to grow it in this country. If you do use goldenseal, make sure you always buy from reputable suppliers who are making efforts to protect this valuable herbal ally. Elecampane is once again a very valuable asset for the lungs, as is hyssop, another wonderful aromatic with expectorant, anti-inflammatory and anti-spasmodic properties. Anti-catarrhals: These include elecampane, aniseed and goldenseal as well as goldenrod, eyebright and elderflower. Elecampane and aniseed are wonderful where phlegm has settled in the lungs whilst the others are more helpful for upper respiratory congestion and sinusitis. 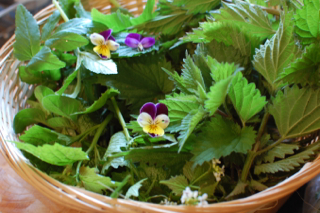 Ground ivy is one of my favourite herbs for clearing catarrh and is very prolific in this region. Immune stimulants and anti-microbials: These herbs can help stop infection from occurring and turning a stuffy nose into a full blown sinus infection. Echinacea root is useful as an immune stimulant in general but I find it particularly useful where problems of the upper respiratory tract are involved – you can often feel a good extract tingling all through your sinuses. Garlic and onion are also very valuable allies, lots of chopped, raw garlic sprinkled on food is wonderfully anti-microbial and very warming. Elderberry is well known for its ability to improve immunity also and thyme pairs well with it as a warming ant-microbial. As always if you are unsure of anything or have pre-existing health concerns it is wise to consult a local herbalist. Bearing that in mind, I hope this has given you a few ideas for how to help yourself feel bright and well during these dark, damp days. I have just spent a lovely few days away visiting my parents and attending Sarah Head’s Sanctuary Herbs Festival which is wonderfully inspiring and highly recommended for those of you who fancy a herbal adventure next year. Now I am back I wanted to let you know about a couple of new ventures starting this month which those of you in the general vicinity may be interested in. Firstly I have a series of talks coming up in the next few months which will be held at Brighton and Hove Therapies which is very close to Brighton station. You can see the details by clicking on the link to the attached flyer below. 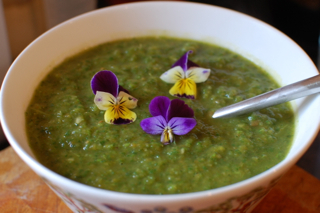 I will also be joining with medicial herbalist Sara Jane Glendinning for a low cost herbal clinic every Thursday morning from 10am to 1pm at The Coach House in Kemptown, Brighton. The Coach House was started up by Sara Jane and is an inspiring venture promoting creative living through the arts and sciences. There are talks, workshops and music running throughout the year and an apothecary garden in the making. For more information see the Coach House website here. The clinic will be open to everyone and consultations will be by donation though there will be a charge for the herbal medicines given. We suggest booking for appointments. And the outlook for lunch it was black. My health it is sure not to last. To see just what could be found. And ground elder growing all around. Then oregano, marjoram and chives. It’s the best lunch that ever I’ve seen. * Jack by the hedge. 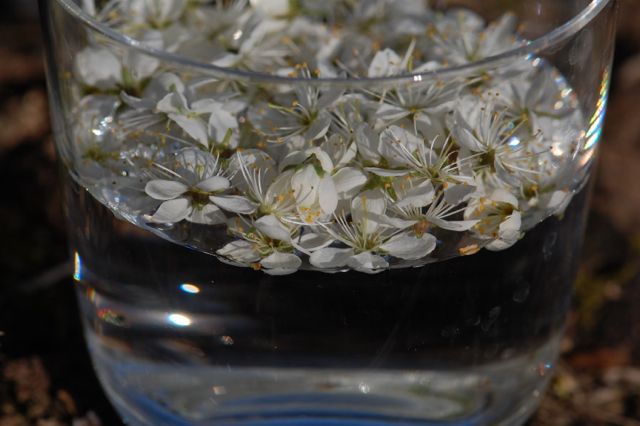 A bright sunny Sunday morning meant the perfect opportunity to get out early and make a Blackthorn blossom remedy. 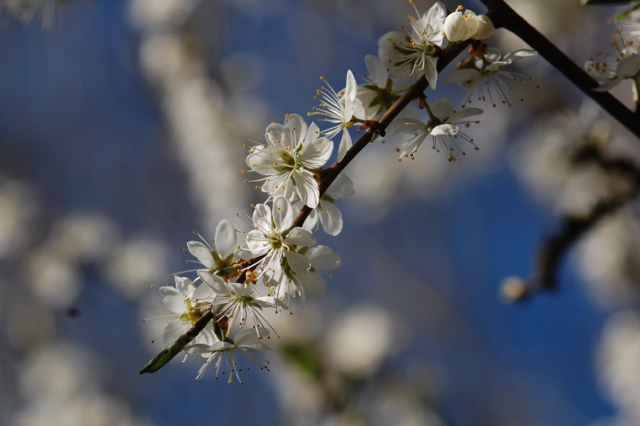 Blackthorn, Prunus spinosa, the same tree that gives us the deep blue sloes in autumn, has currently exploded into confetti-like blooms all over the hedgerows and woodland edges, making such a cheerful sight after the muted tones of winter. 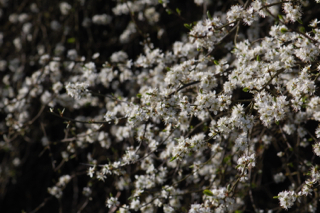 Because the blossom of blackthorn comes out before the leaves the effect is even more striking as the pure white flowers stand out so dramatically against the hard, dark wood, without any background of green to soften the effect. This makes it easy to differentiate from the hawthorn, also known as whitethorn, whose leaves appear before the blossoms. 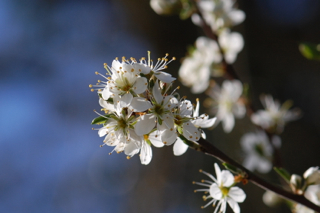 Blackthorn has long been associated with darkness; the unknown and mysterious, the subconscious and feared, and yet, in early Spring, it is the very epitome of brightness, beauty and expansion. As such it was considered symbolic of the cycles of life and death by our ancestors who honoured it as one of the trees in the Celtic alphabet or Ogham. 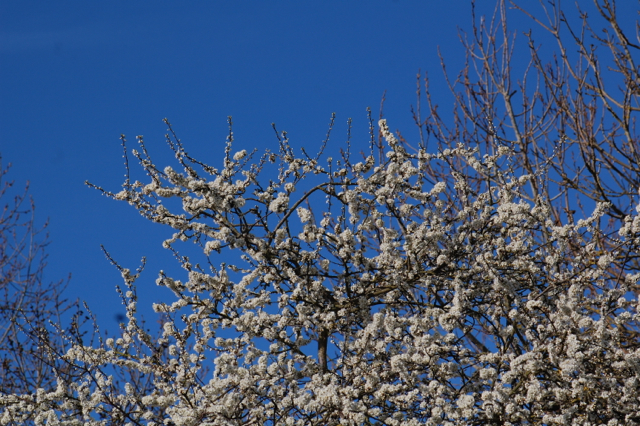 For me Blackthorn is the tree of transformation; from winter to spring, from darkness to light, from introversion to extroversion, from sadness to joy. It honours each part of the cycle as equal without only valuing the experiences that feel most pleasant. It is a great remedy for everyone to take as we emerge from winter but can be supportive all year round for those who are experiencing change or feel overwhelmed by negative emotions. 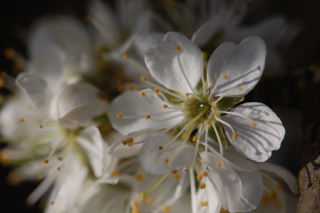 Blackthorn will support us with moving through these whilst also helping us to go deep within ourselves to find the lessons in all our experiences. It is important to understand that this, or any, flower remedy is not about superimposing a ‘positive’ emotion over a ‘negative’ one in order to live a life devoid of painful experience. They are just about offering support and the potential of opening up a little when we feel overwhelmed or constricted and thus unable to flow freely with our feelings. At some point we may find we no longer need them but until then we have them as support when the way ahead is unclear. It has often been observed that the word emotion refers to energy in motion (e-motion) and this is a beautiful reflection. Emotions come and go, we as the witnesser of emotion remain in stillness. However it is our habit, or the habit of mind, to immediately relate to every emotion that arises as a true and rightful aspect of who we believe ourselves to be. Thoughts such as ‘I am unworthy,’ ‘I am afraid’, ‘I am ugly’, or equally, ‘I am worthy’, ‘I am brave’, ‘I am beautiful’, remain unchecked and unverified and thus we believe them to be reality. Beauty, worthiness and bravery are concepts that exist in the mind only. Comparing them to other concepts lends them a kind of weight but what we as consciousness are is beyond all concepts. It is formless, unchanging being and we are always it, whatever we may be experiencing in the moment. When we begin to identify less strongly with our emotions the need to change them becomes less pronounced. We may still feel any number of strong emotions, from fear to grief or even hatred, but we no longer think these define us and so they do not make us suffer in the same way as before. In fact, often when the tempests come, we can find a joy and a peace that co-exist alongside them. Somehow we are both and neither, they simply arise in the vastness of our own hearts.